Few people know that the Halloween celebration probably comes from an ancient Greek folklore of the island of Rhodes. It seems that long ago in that island they did celebrate the rite of the Kelidonismos (from khelidon = swallow) with a procession of boys who, disguised as swallows, moved from house to house singing nursery rhymes and begging for gifts. He who gave cookies and bread to the “swallows” was saved from the terrible threads that otherwise would affect them. Great relevancy with the “trick or treat” of the Anglo-Saxon holiday. The swallow is probably the most popular bird in the world and in the popular imagination is without any doubt the representation of the love of a being towards its own house, therefore in all popular traditions, even the oldest ones, its migrant exploits are many times repeated and told through the history of populations and of ancient civilizations. It is not easy to make a list of all what concerns the swallow. The history, the literature, the music, the legends, the cultures, all seem strongly linked to this tiny small bird that has invaded our world. Even in old Greece the swallow was linked to the cult of the annual regeneration, seen the coincidence of its arrival with the wakening of the nature. Also the present saying “One swallow does not make a summer”, in German “Eine Schwalbe macht moch keinen Sommer” and in Italian (maybe for the different latitude), “Una rondine non fa primavera” has been taken by Aristotle himself, when he did affirm with other words the same concept: …. like a swallow does not make a summer, so a moment of happiness does not make a lucky man. But also Homer, Anacreon, Hesiod, Aristophanes, Pliny have given their contribution with their works as well as the classical musicians of the last centuries. The same Bible mentions this, reminding in the Psalm 84 the sparrow as well as the swallow who has found … “a nest for herself, where she may lay her young”… Then, often we remember famous sentences of Shakespeare’s comedies stopping on the words we know without continuing with others that complete their meaning. In the Richard III, where he quotes the famous … “my kingdom for a horse”… dream also to be then able to fly with the wings of a swallow. More recent traditions see the swallow as national emblem in Austria and in Estonia where they identify in this bird their blue sky, symbol of freedom and of eternal happiness. Always after the Estonian traditions, he who kills a swallow becomes blind, quite similar to some local Italian legends that even jeopardized the life of the parents or the beloved persons. A tradition of the old English seamen was that of tattooing a swallow on the arm after having passed the milestone of the 5.000 miles of sailing and a second one after the 10.000. To have a swallow tattooed meant to be sure of having a safe return home. Also in the Anglo-Saxon world, to cause damage to a swallow nest in their own farm meant leading their cattle not to produce any more milk or even to get the hens stopping in laying eggs. Now we understand the reason of so much anxiety waiting for its return in spring and the wish of seeing them nesting under their own roofs. It is clear that this fact of tolerance and benevolence in regard of this bird, probably done by all the old world populations, has led the swallow to be strongly linked to its own nesting site thus consolidating its permanence during very long periods. As we shall see, the swallow never abandons its nest unless the site where it is placed is destroyed or when one of the partners dies. In this regard, are not rare the cases of nesting in the same site for many consecutive years and is reported the memory of an uninterrupted occupation of a nest for fourty eight years. Small curiosities have been later on added in the profane attempt of giving technical explanations to behaviours that were often noted. When a swallow is flying low rain is approaching, when it flies slowly there will be good weather, when it flies fast and darting the weather is going to change. Then there is information about the use of the swallow as carrier of messages, as was done for the homing pigeon during the two major wars of the last century. It is told that the old Romans did already use the swallows as messengers. Quintus Fabius Pictor during the Second Punic War used a swallow secretely brought to him from a Roman encampment occupied by the Carthaginians, to send it back with a message advising the friends of the occupied garrison about when the liberation attack would have started. Even funnier about that bookmaker of old Rome who, living well far from the City, freed as soon as the race at the Circus Maximus was ended, the home swallows he was carrying with him during the sporting events, painted with the colours of the winner thus communicating the result in very little time. Whatever they are, legends, stories or tales, they do not take us away from the main characteristic of this bird, that is the attachment to the birthplace. Home sweet home, as the Ango-Saxons say and “bentornata a casa rondinella” (welcome back home little swallow) the Italians. It is now well established that the arrival of the swallows does no longer coincides with the beginning of the spring, seen the abrupt change of our world’s weather situation but who one day, who another, all expect by the approach of March equinox, the arrival of this gay small bird coming back to its home. Linnaeus, more as naturalist scholar than as good observer, had surely noted the sudden spring arrival and the following sudden autumn departure of the swallow but was never able to give a plausible and logical explanation to this fact, paradoxically and rightly garbling on this bird so much close to us, the tangle of the migration. 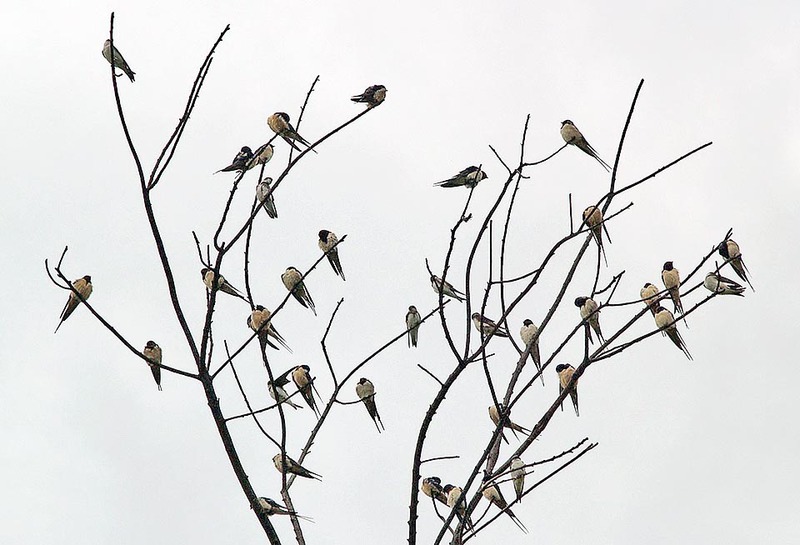 It was noted that by the approach of autumn, the swallows suddenly left their usual sites and gathered in the reeds or on the banks of the water streams, in huge flocks to spend there the night. Then, suddenly, in the morning they were all gone and, just as it happens, remained accidentally some dead bodies floating on the water of individuals weakened or lacking of forces. Based on these facts and on what fishermen reported, Linnaeus maintained that the swallows did spend the winter hibernating on the bottom of the lakes or the seas and that they did reappear as suddenly as they had disappeared, when the good season was approaching. So that somebody during the cold springs was able to pick up some of them shivered and soaked, first specimens of the migration, thinking that they did really come out from the water after the wintering. Unthinkable that a naturalist of such a level got to the point of supporting this concept, the fact remains that still in 1835 the Stockholm Royal Swedish Academy of Sciences that have never shared his ideas, offered a reward to anyone able to carry a swallow in winter. It goes without saying that nobody reported to get the substantial prize. In 1856 Svil Nellson with one of his treaties at last did put an end to this legend and only in 1912 they were finally able to get the confirmation of the long voyage of this small bird, by catching in South Africa one swallow ringed in England. Before the existence of the man, the migrant birds already were flying since immemorial time over lands and seas. So, since the old history the problem of the migration had created the most varied legends and interpretations, so much that at the time of Aristotle and Pliny, even if this last was wittier in the matter, it was thought of a morphological change of the species rather than to the idea of such an upheaval. So the Redstart (Phoenicurus phoenicurus), became in winter a Robin (Erithacus rubecula) and the Cuckoo (Cuculus canorus) a Sparrowhawk (Accipiter nisus). Finally, they got to give a more human interpretation to the sudden arrival of some birds that then suddenly disappeared without any notice. They made a distinction between the auspiscious birds and the bad omen ones. And so the Bohemian Waxwing (Bombycilla garrulus) ended up among the worst seen that in German it is called Kriegvogel, bird of the war, and in Holland Pestvogel, the bird of the plague, others among the meteorological indicators such as the Red-throated loon (Gavia stellata) called Rain goose = the goose of the rain, whilst to our swallow was reserved a greater consideration, seen that it announced only positive things. And here is a final consideration about the story of this bird. This related by the Swedish zoologist Kai Curry-Lindahl in his book of the seventies “The birds through the sea and the land” recollecting a swallow ringed by him when young in the nest placed under the porch of the summer holidays house in Finland, observed for some years and then disappeared. It was found years later, dying, in the Tsavo national park in Kenya and now conserved, poorly preserved, in Nairobi National Museum. A small bird who had been flying every year for tens of thousands of km up and down those skies. The fate and the activity of this naturalist led him often and for many years in those same places, so much to strictly collaborate with the Kenyan institutions since 1974 and to spend the final part of his life close to the swallow who had seen his youth. The Barn swallow (Hirundo rustica Linnaeus, 1758) belongs to the order of the Passeriformes and to the family of the Hirundinidae and is by far the most common and most known swallow in the world. Well, we can say the most common and known because it has invaded our world and because when it is back under our balconies or porches becomes suddenly familiar and urbanized but it is unthinkable to sight it in Africa or in other wintering quarters peacefully perched on the railing of a balcony or on a cart stopped in a street. Over there the swallow is wild, lives with the elephants and the giraffes shying away, perhaps for the better, from our western fury replacing it with their closeness and protection. They think that there are more than 200 million of specimens of this species migrating each year. The etymology of the scientific name comes from the Latin “hirundo” = swallow and “rustica” = rural. Being known in most of the world this bird is probably the species with the greatest number of properly assigned vulgar names, unlike others to whom a name has been given just only because necessity of literature even by populations who never had the occasion to see them in their own habitat. Some European names: in English Barn Swallow; in German Rauchschwalbe, in Spanish Golondrina Común, in French Hirondelle rustique, in Italian Rondine and in Portuguese Andorinha-das-chaminés. The species is cosmopolitan and is present in all continents. In Europe it gets to occupy in the north the whole Scandinavian Peninsula and in Asia it avoids only the Arctic tundra. In the south it nests on the African Mediterranean coasts, in Middle East and following north of the great Indian mountainous chains, going down then to occupy totally China up to Taiwan and Japan. In America it occupies most of Canada, the United States of America and the northern part of Mexico. Practically the swallow spends six summer months in the Boreal hemisphere and the winter in the Southern one implementing one of the most massive migrations on our planet. The wintering sites are various and it seems that the same assiduity in coming back to the native places corresponds also to the choice of the winter quarters. 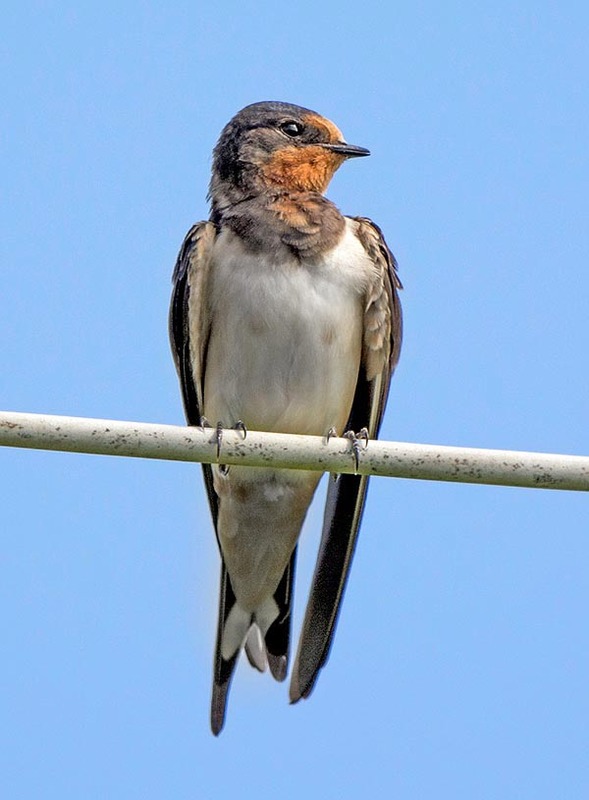 The European swallows and part of the Asian ones winter in all the sub-Saharan Africa whilst the great Asian population winters in the Indian subcontinent, in the Indochinese peninsula, in Indonesia and on the northern coasts of Australia. The American swallows winter from Central America reaching the Argentinean pampa. The major voyages take place in huge flocks at times immense announced in advance by gatherings on the departure sites that have always astonished all those who had the opportunity to observe them. These flocks take form in very few days and in customary places as if there was a firm date in that place and for that day in which the great flight will be performed. This precision has originated an arrival almost simultaneous in specific areas and a similar preciseness in the leaving day. “St. Benedict the swallow under the roof”, recites an old Italian proverb and in fact in almost all continental Europe this day is now confirmed since millennia with much precision. 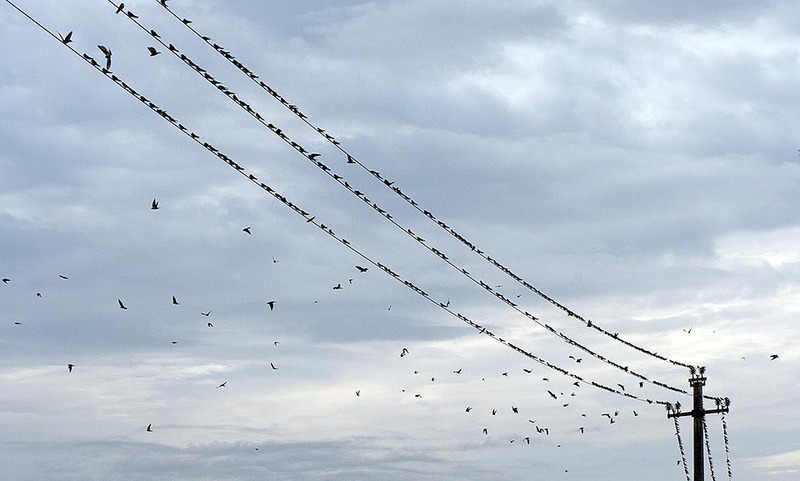 Autumn recurrence, for the temperate belt of Europe, is September 20th day on which almost suddenly and all together the swallows disappear from our skies. It must be remembered that the ascent towards the summer boreal quarters is slower and less gradual than that towards the wintering zones, in particular for the African populations that slowly, already since January, begin the ascent northwards crossing the whole African continent and stopping in the area of the Rift Valley and of the Nile Basin in the eastern part and in the great basins of central and western Africa in the western part. On the chosen date, determined the climate conditions, here is the great sacrifice, who coasting the Atlantic, who the Indian Ocean, who over the Sahara and for the American part along Central America, all precipitate in this race to the north. This massive migration is unluckily at times source of heavy tragedies leading to deadly decimations of entire flocks of these birds. The spring months are for the temperate zones periods of remarkable and sudden changes of the climate conditions, with sudden winter resurgences, rapid changes of the winds, unexpected and heavy rains with severe temperature decreases, a series of adversities that for a small animal weighing few grams already submitted to a pitiless effort, turns fatal. It happens then that a flock of tens of thousands of specimens is catapulted in the middle of the ocean at the mercy of the winds or even obliged to stop right in the middle of a desert like the Sahara without any possibility of finding any rest. And yet, the huge number and the perseverance of an entire population are such that the survival of the species is always guaranteed. 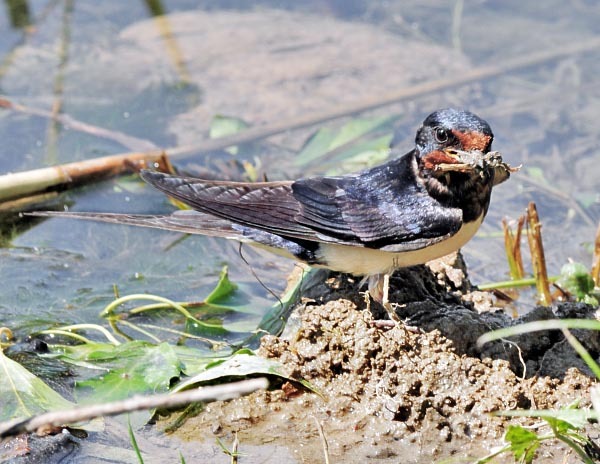 In the nesting period the swallow is the typical inhabitant of the urban areas, of the cultivated countries, of the farms, of the orchards, of the areas rich of water and any other place where the insects, its essential food, are easy to be found. It loves sites with low vegetation, prairies and fields but in the meantime having open constructions suitable for their shelter and nesting, such as porches, stables, barns. Also the presence of electric wires or artificial supports or also branches of dead trees jutting on their area have extreme importance for their presence. The coexistence with the human being appears now established since millennia, from when the man has approached the agriculture. Together with him it has taken advantage from the continuous breakthroughs in the construction of his dwellings as well as from the development of an agricultural activity and of deforestation that have highly favoured it, with an unexpected abundance of food and of places for nesting. Unluckily rendering it also dangerously dependant. Before, the swallows nest in the caves, in the rocky ravines and on the steep cliffs, nowadays only in close contact with the man so much to suffer violent decreases when new typologies of agriculture or of sudden urbanization have been adopted. 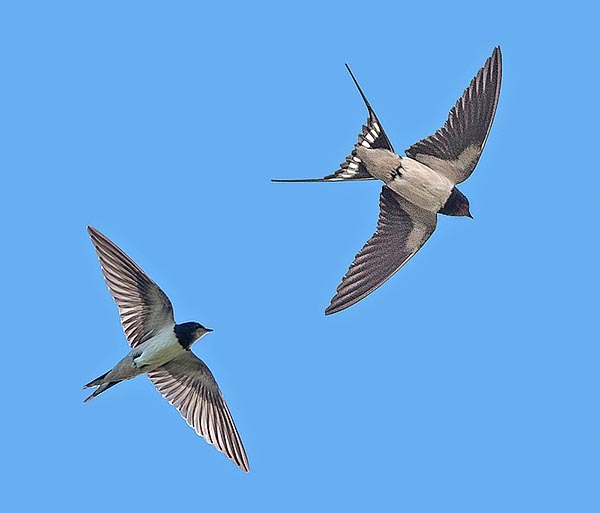 The swallow loves the human being but rarely follows him in the city, making room to two other insectivorous species, the House martin (Delichon urbicum) and the Common swift (Apus apus). The habitat of the swallow is however extremely vast and variable and goes from the coasts to the high mountain up to more than 3000 m of altitude in the large Asian chains, on the Caucasus and in North America. Conversely, it does not love forests or areas highly wooded even if loves flying over them looking for food, as well as the deserts notoriously poor of insects. In the winter time and during the migrations the swallows changes totally its social look towards the human being. We have said that in the winter quarters it frequents the savannahs, the swamps, the vast inner lakes and the steppe areas getting the most from the research of food and fighting against the extremely strong alimentary pressure caused by its overlapping with the local populations of hirundinids. In the wintering areas the social life of the swallow is rather accentuated, deliberately implemented with the purpose of a common defence against the aggressors and its presence is always marked by huge flocks wandering ceaselessly over the occupied territories to gather finally for the night in immense crowds usually close to reeds or woodlands. 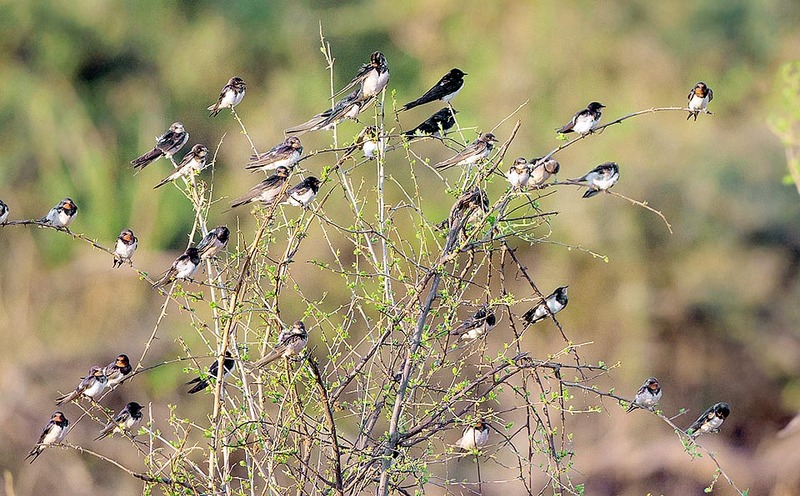 In Nigeria is known a site that hosts 1,5 million of specimens and even more famous and historical is a small reed close to the city of Durban in South Africa, where in winter live about three millions of swallows, about the 8% of the total European population. 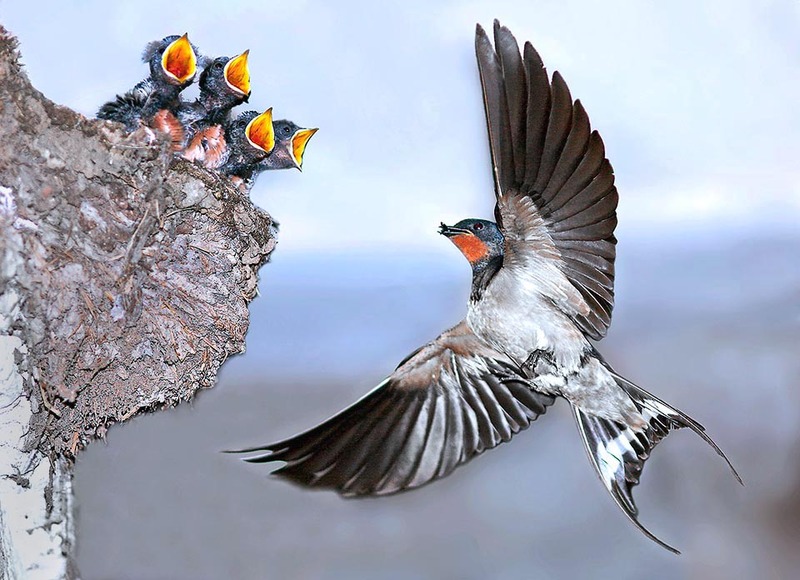 During the nidification, as we shall see, the swallow keeps always a strong sociality among the species even if it is more aggressive but is limited to the members of the colony and of the neighbouring populations. The swallow is a pure insectivore and nourishes of all flying insects considering that its life is almost totally spent flying. It nourishes hunting flying insects with ups and downs and incredible lightness, it drinks skimming the water surface gliding precisely, washes at times diving some cm under the surface even if it prefers literally slipping on the same, it often mates flying, nourishes the chicks already flying with aerial surplaces. It puts the feet on the ground only for collecting material to construct the nest and in these occasions it shows how small and unsuitable to the terrestrial life are its very short legs. The swallow is an about 20 g weighing small bird, less than 20 cm long of which up to 7 cm of tail and a wingspan reaching the 35 cm. The wings are typical to the long range migrants and are long and narrow and strongly hawklike. The livery has the upper part black with bluish and bronze reflections whilst the lower part is totally candid. The front and the throat are reddish delimited by a black line as collar, well marked. The underwing evidences the white of the lower coverts in contrast to the black upper ones. The tail is very forked, with the two outer feathers very long and thin and shows in the lower part some lined and transversal white spots. The bill is short and wide and hides a rather large mouth suitable for catching insects while flying. The are no marked sexual dimorphisms apart in the length of the tail, slightly shorter in the female and in the colours slightly brighter and more shining in the male. The young distinguish due to the forked tail almost absent during the first month of life and the yellowish outlines of the mouth. 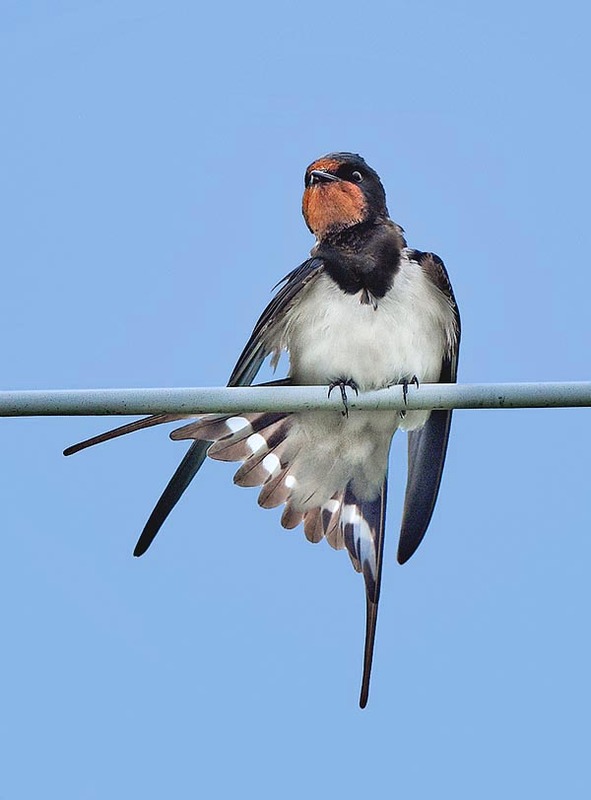 For what concerns the length of the tail it seems that the northern swallows have longer size than those living in more temperate ranges, however the length is always an indication of the age, therefore the longer is the tail the older is the individual. It is worthy to remind the umpteenth legend concerning the reddish spot that the swallow has on the head and the throat. The crucified Jesus had a spine of the crown that had been put on his head by his persecutors stinging painfully one eye. He then asked a passing by bat to take off this spine but the animal pretended not to understand. Other small birds passed and only that who will be our swallow accepted to help him, tearing with force the spine but indelibly staining its own throat with a drop of blood. “May you be blessed, from now on nobody will ever harass you”. So said the Christ! As usual for the birds with such vast ranges, also for the swallows have been classified various subspecies on which often have arisen disputes and different interpretations. Presently are recognized six subspecies showing some differences in the livery and in the various occupied ranges. Hirundo rustica rustica, the typical European species, from the Mediterranean and Asian coasts up to the Himalayan chains. Hirundo rustica savignii, the species living in the Nile Valley. Hirundo rustica gutturalis, from Himalaya to Japan and south up to Indonesia and New Guinea. Hirundo rustica tytleri, of Siberia, Mongolia and northern China. Hirundo rustica transitiva, typical to Turkey, Lebanon and Israel with a much more reddish livery. Hirundo rustica erythrogaster, of North America. The swallow is very talkative particularly during the nesting time when it emits relentlessly its singsong beginning well before the sunrise and often going on until late sunset. Also during the other periods and during the migration its emits usually a short contact chirping with its similars, even more accentuated when referred to the warning announcing the approaching of a danger. Very alert and curious, is a good warning also for the other birds that live with it. It is also able to imitate perfectly the song of other passeriforms. The song of the swallow is not melodious but garbled and missing of any harmonic appearance. Over time many legends and tales have arisen in an attempt to give a plausible reason to this absence as if there was a primordial cause in the fact that the dearest bird to humans had not, besides beauty and elegance, also a nice song. 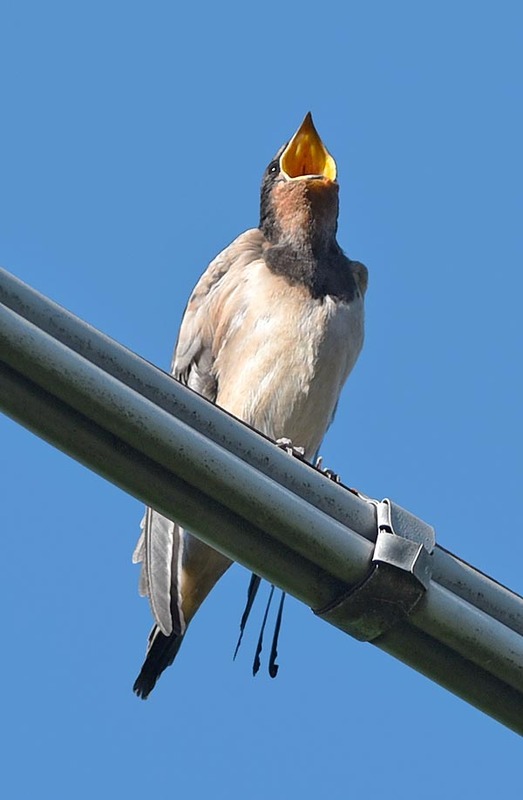 In this way we have moved from a German legend that reminds that the swallow was melodious once but, being not heard by anyone, had considered inappropriate to continue in its warbles. Another one, reminded in the Flandres and in Tirol talks about the swallows that during Jesus’ agony perched on the bar of the cross continued to sing so much loudly and merrily that they became unbearable for the dying Christ. For that reason since that day they were condemned only to talk and get the food while flying. Another Anglo-Saxon legend says that the swallow, accustomed to perch on the fences close to spinning women, has then learnt how to make fun of them repeating continuously this rhyme: “My mistress has lost, my mistress has lost, her spool of red thread, her spool of red thread and her scissors”. When repeated quickly, it is nothing else than the onomatopoeic sound of its farraginous song. The swallows do have practically the innate obsession of coming back to the birthplace and only unforeseen incidents may hinder this wish they have. The males precede by little the females on the nest sites occupying and defending the territory waiting for the arrival of the female. It is a monogamous species with couples that last for the period of nidification but are known cases of polygamy between the couples that however do not modify the relations between partners. Once place and nest are chosen, they spend some weeks before the spawning, during which the pair remains in place occupying and defending fiercely the territory. 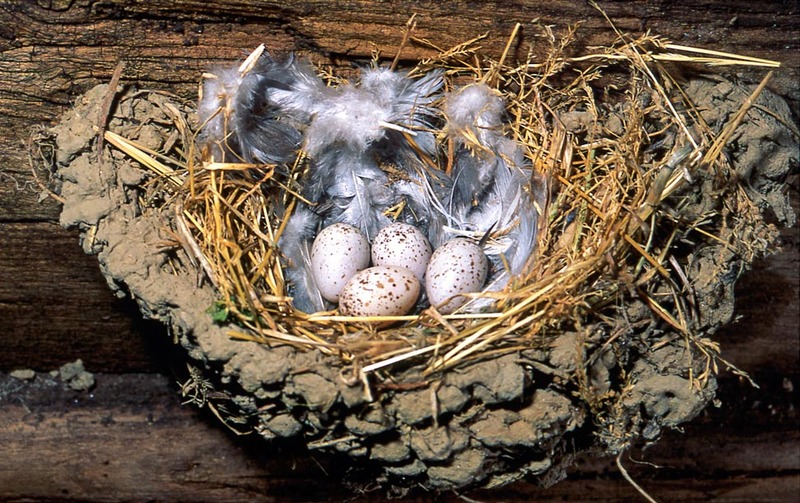 The nest, even if pre-existent, is renewed from year to year, adding and reinforcing with new mud and coating it inside with feathers and very soft material collected while flying. The nest is an open semi-circular cup built with mud mixed with vegetal specks of straw leaning against a vertical wall almost in touch with the ceiling or the overlying crossing beam such to create a very safe and unreachable shelter. After years of renewal at times the nest is a heap increasingly high and such to be abandoned because of lack of space in height. 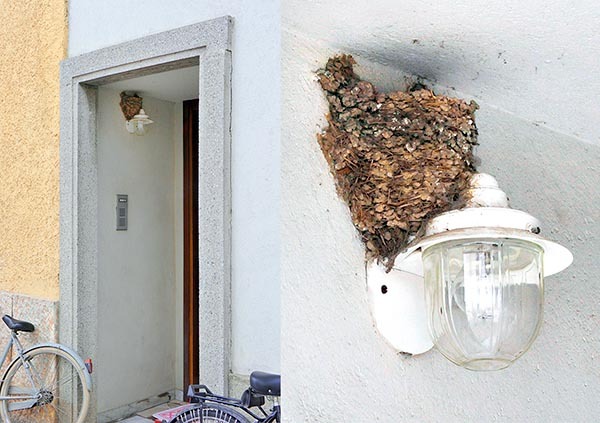 The swallow nests in colonies even very numerous not displaying in this case any friction with the nearby couples but taking advantage of the help of the community for the common defence. Often in old stables at heights at times less than two metres and only few tens of cm over the head of the livestock, we can see series of nests lined up at less than 50 cm of distance each other in safe harmony. The swallow lays twice a year but in favourable seasons even three may take place. 3 to 6 eggs are laid, averagely 4-5 that are brooded only by the female for about 16-18 days. The eggs are oblong of cream colour with a strong reddish dotting in the ampler part. The construction of the nest and the care of the progeny are coordinated by both partners. The chicks start flying after about three weeks and keep dependent from the parents even when the couple has already begun a new deposition. The absolute independence is fairly fast though the young cohabit with the family till the migration. 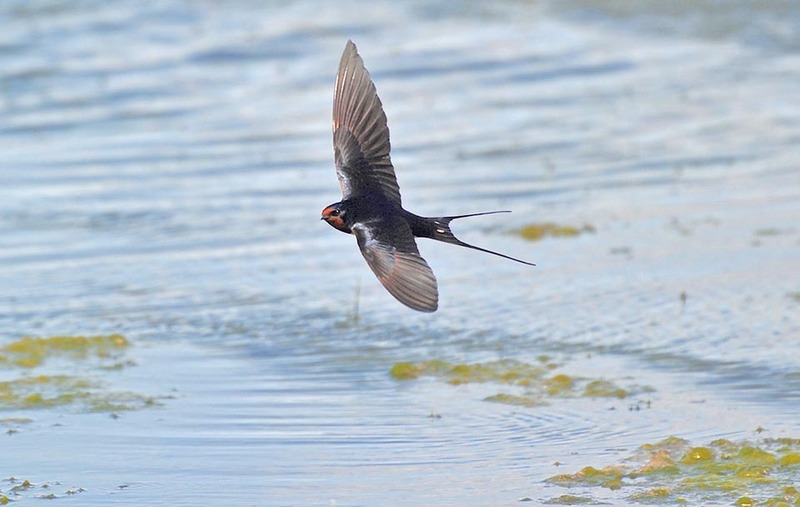 The swallow is subject to many dangers and a strong death rate during the first year of life, when it faces for the first time a so long and dangerous migration. 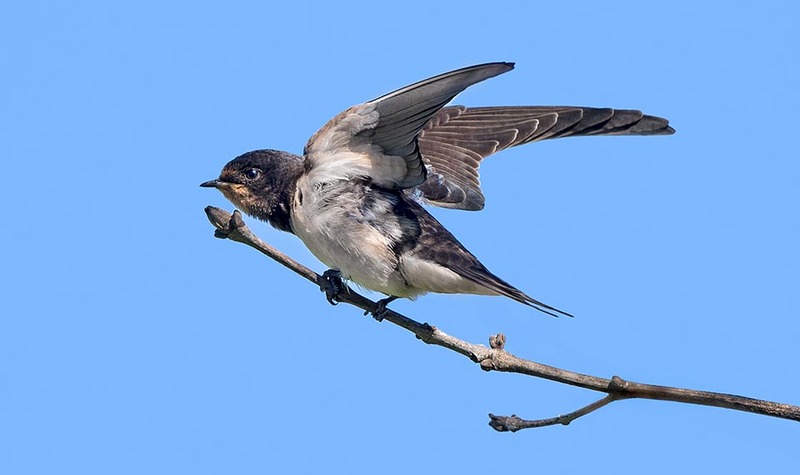 Once the first phase of life is overcome, the swallow can live some years but due to the factual difficulties caused by its travelling life, the species is not to be considered as long-living. In the last decades all the populations of swallows have met showy reductions at times alarming. Passed the period of the use of DDT during which the reduction was particularly serious and heavy, the situation has remained unluckily at level constantly lowering due to the fast and important modifications brought by the agriculture in the western world. The disappearance of the broad meadows replaced by an intensive monoculture, the abandonment of the rural houses and the modernization in the cattle breeding with structural changes to the buildings, has now irrevocably changed the habitat of our swallow rendering it often uninhabitable for the same. To this we have to add the climate change under way that renders even more difficult the adaptation of this bird to the new conditions. Many are the variables that contribute or hinder the development of this species. It was hoped that the dilation of the seasons in the northern hemisphere might give more time to the nidification of these birds increasing the number of the newborns but, conversely, it was found that warmer summers limit the quantity of available insects for their feeding. Also, the same difficulties are found in the wintering sites, difficulties at times considerable for their survival. The species is not considered as endangered but is kept constantly and carefully under control.